Artisan classes allow a player to specialize in one or more of the following skill trees. 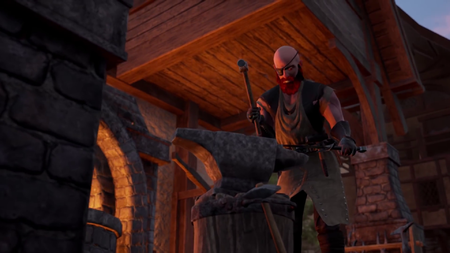 Crafting and gathering is a very important component of the economy that players will have direct control over. Whether you wish to build a sprawling plantation around your house, or wish to travel the vast wilderness in search of treasure and resources. Artisan classes do not allow a character to become a master of all. 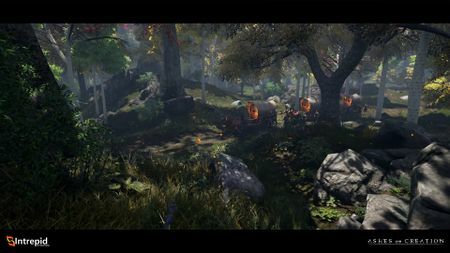 Players must choose a path in the artisan skill tree for each character. Branching into specific paths allows the player an opportunity to specialize in certain areas. This encourages player inter-dependency, enhancing the artisan experience. Choice of profession does not affect a player's stats. Characters within a single account (Alts) may have different professions. The ability to gather, process or craft requires tools at an appropriate level in order to accomplish the task at hand. Tools will have durability and tool lifespans. Tools may become non-repairable, requiring re crafting. Artisans within Ashes of Creation must choose a path in their artisan skill tree. This inter-dependency establishes a supply chain from raw materials to finished product. Each stage of the chain may require caravans to transport goods from one artisan to another. By killing mobs and bosses. From deconstructing weapons or armor. By purchasing them from other players. Refining the raw materials with the Processing profession. Crafting the finished product using its crafting recipe. Recipes are also obtainable from boss drops. Crafting in Ashes of Creation is recipe based, not RNG based. Increasing one stat at the expense of another. Making an item more magical versus more physical. Crafting stations can be located on freeholds or within nodes. Player-owned Taverns on freehold plots. Freehold buildings are able to be levelled up based on the length of time and productivity of the freehold. Freehold progression unlocks new bonuses, abilities and capabilities. Quests that might only be gathered from the player-owned taverns. Meals that grant buffs for a period of time after a player leaves. Recipes that could potentially be sold to cooking professions, that may only be obtained from a player-owned business in a certain area. The longer the tavern is in business and the more patrons served, the faster the tavern will level up. Artisan classes are scheduled for release in Alpha-1. The AOC Dungeon - A look at Crafting in Ashes of Creation. ↑ About Ashes of Creation. ↑ 3.0 3.1 Livestream, 24 May 2017 (32:07). ↑ 5.0 5.1 Livestream, 5 May 2017 (6:12). ↑ Livestream, 18 July 2017 (37:25). ↑ Video, 30 April 2017 (10:07). ↑ 8.0 8.1 Interview, 11 May 2018 (38:25). ↑ 10.0 10.1 10.2 10.3 Livestream, 5 May 2017 (8:22). ↑ Livestream, 8 May 2017 (20:41). ↑ Livestream, 18 July 2017 (38:30). ↑ Livestream, 26 May 2017 (26:00). ↑ Interview, 11 May 2018 (24:18). ↑ Livestream, 5 May 2017 (20:41). ↑ Livestream, 26 May 2017 (5:25). ↑ Livestream, 4 June 2018 (35:11). ↑ 19.0 19.1 Livestream, 1 June 2017 (24:30). ↑ Livestream, 12 May 2017 (1:00:18). ↑ 21.0 21.1 21.2 Podcast, 23 April 2018 (29:56). ↑ 22.0 22.1 22.2 Podcast, 11 May 2018 (48:29). ↑ Livestream, 26 May 2017 (50:00). ↑ Podcast, 11 May 2018 (59:25). This page's content was last modified on 20 April 2019, at 00:40.